Scag Tiger Cat II 61"
Re-engineered from the ground up, the all-new Tiger Cat II has set a new benchmark for mid-sized zero-turn riders. Highly maneuverable and equal parts tough and productive, this machine makes quick work of the open areas with speeds up to 12 mph, while also easily getting through the tight spots. With a heavy-duty tubular steel frame, the Velocity Plus deck, a more powerful drive system and larger capacity fuel tanks, this mower delivers it all in big cat style. Featuring a low center-of-gravity and large 24” drive tires, the Tiger Cat II provides the stability and traction you need for challenging terrain. On top of all these great features, a 4-point iso-mounted, weight adjustable, torsion spring suspension seat ensures a comfortable ride as you get the job done. -Torsion spring suspension seat adjusts to operator’s weight to provide superior comfort. Seat features full padding, forward/rearward adjustment, high back, adjustable armrests and adjustable back angle. -4-point rubber iso-mount system under the seat absorbs front-to-back and side-to-side energy to soften the bumps and provide an incredibly comfortable ride. -Heavy-duty tubular steel frame provides a solid foundation for years of reliable service; replaceable front caster wheel weldment. -Fabricated, welded and reinforced Velocity Plus cutter deck is ultra-strong and true commercial grade. Tri-Plate deck is nearly 1/2” thick. 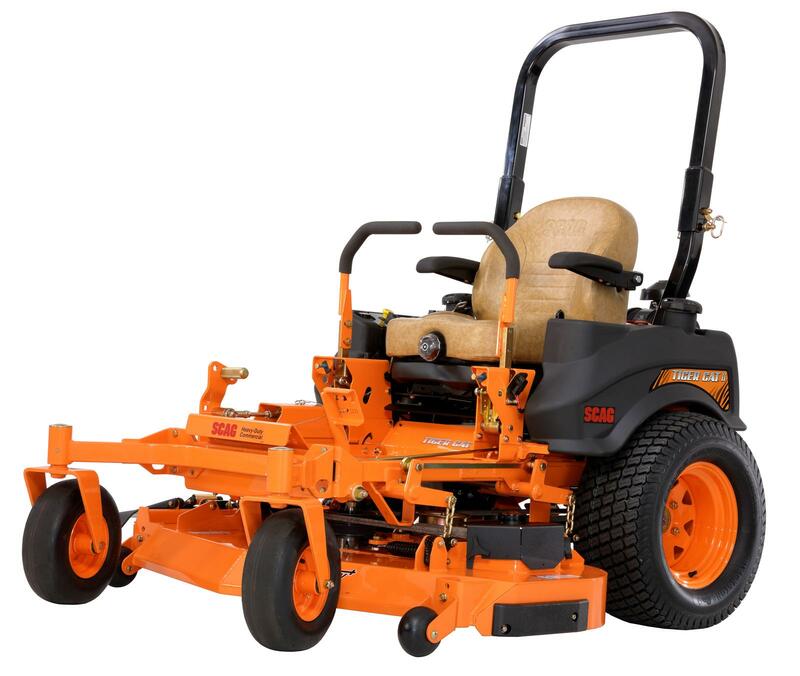 -Powerful drive system features dual 12cc pumps and high torque wheel motors ensure reliable power; pump cooling fans further cool the hydraulic system for added reliability. -Up to 12 mph forward speed makes quick work of tough jobs. -9.5 gallon fuel capacity for hours of cutting time. Each tank includes a fuel gauge. Left-side tank features a molded-in cup holder for extra convenience. -Large 24” drive tires deliver superior traction and a smooth ride. -Foot-operated braking system allows the operator to keep hands on the steering controls while activating an AUSCO disc braking system. Delivers dependable, non-slip holding power.